Mark your calendars for Thursday, March 26th at 1 pm and submit your questions today for this virtual experience. 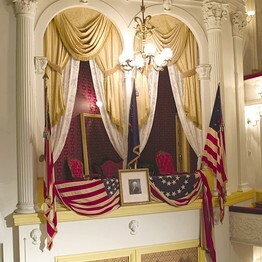 Discovery Education is presenting a virtual event in which you can take your students on a virtual filed trip to Ford's Theater to participate in a live discussion on the legacy of our 16th president and the circumstances surrounding his assassination. Click here to get more details and submit a question that may be answered during the live presentation.